In this example you can see the jQuery uses the success property of the settings object to specify the callback. This isn't a promise but a way to pass in the callback functions. When the ajax call is complete, it calls the success function. Depending on the library that uses asynchronous operations, you might pass in a set of callbacks (e.g. for success or failure). There are a ton of ways to accomplish this. Because many libraries are starting to take on the promise pattern, handling asynchronous operations should be easier no matter what code you're writing (e.g. NodeJS, in-browser JS, etc.). But what does a promise look like from the other side? Notice that in jQuery we're using a call to always to specify that we want to be called whether the success or failure was called. AngularJS uses an implementation (see the $q variable) that is started with a call to defer(). This returns an object that contains ways to mark a successful or failure condition as well as the promise itself. Notice that in the _callMe function the d variable is created by calling $q.defer() then the d.promise is returned from the function so that the caller can call the promise methods (e.g. then). When the actual asynchronous operation is performed (in this case mocked up as a setTimeout call), we can use the resolve method on the defer'd object to tell the promise that we completed successfully (and therefore call the first function in the then method below). If we were to call reject, the second method (the failure call) would be called instead. You can play with these examples in JSFiddle and see what you can make happen. 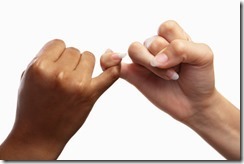 Promises are a really simple and cool way to handle asynchronicity. What I really like about it is that it simplifies your code (so that you don't have the triangle of doom when you have to nest callback functions inside each other. This makes it easy.